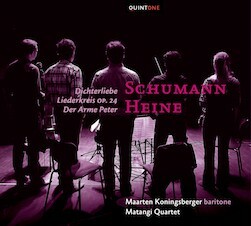 Schumann Lieder in an arrangement for baritone and string quartet? Schumann’s piano accompaniments are extremely beautiful and among the best ever written. However, in 2010 the Concertgebouw in Amsterdam asked me to sing Dichterliebe at a celebration concert for Schumann’s 200th birthday. It was to be a special concert and an arrangement for baritone and four string players from the Orchestra had been commissioned. This seemed a little odd at first, but I was also quite excited by the idea. The premiere turned out to be a great success. Wim ten Have is a great connoisseur of Schumann’s music, and his score follows the original meticulously and with great respect. I was told by some that they had heard ‘new voices’ in the accompaniment, although none were added. Another comment was that ‘my ears opened in a new way’ while listening to strings playing this famous piano score. I myself had had rather similar experiences during the rehearsals, probably due to the fact that now four musicians were playing the score instead of one, which inevitably stimulates musical dialogue. The singer and listener both experience new sounds, new colours, different tempi, other expressions. The arrangement stayed on the shelf until I asked the Matangi Quartet to join me in this adventure. Since then we have performed this wonderful music at many concerts, always with great joy and enthousiasm of the audiences, which has led to this cd. Q15005, CD, booklet 20 p.